Your Canadian source for Berkey Water systems, filters and parts. Consistently largest the largest stock of Berkey Water Filters in Canada and ship out of our main location in Ontario. No surprise costs for border brokers, shipping, insurance and handling etc. A Berkey Water Purifier has its roots with Royal Doulton; definitely not the new kid on the block but a company with 200 years of history. As early as 1827 John Doulton was in the water filter business, using various earth and clay materials in the first Doulton water filters. In 1837 Queen Victoria had a water filter commissioned and the recognized John Doulton earned the right to embellish each of his units with the Royal Crest because of her pleasure with his product. In 1901 King Edward VII knighted Henry Doulton and honoured the company by authorizing it to use the word ROYAL in reference to its products. For a bit more detail of history click here. Diatomaceous Earth [D.E.] is a fossil substance made up of tiny silicon shells left by one celled algae called diatoms over the last 150,000,000 years, then refined into exquisite porcelain and pottery. This is at the core of the Doulton ceramic filter element the Sterasyl™ Ceramic Water Filter Elements. The mechanical filtration within the Berkey Water Filter gravity element water filters is designed to clean dubious or unfiltered water into potable water. Berkey in the US tested the Black Berkey purification elements which are made with another media called Sterasyl. Sterasyl ceramic filters filter more than 10,000 times the concentration of pathogens per liter than is required by standard test protocol. No pathogens were cultured from the filtered water. None were able to be detected, even under an electron microscope, setting a new standard in water purification. The above table considers drinking water requirements based on average uses. If your use of potable water includes re-hydrating dehydrated food and for cooking, or if weather is hotter than normal, or people are more than normally physically active, your water requirements will be greater than those in the table shown above. *Don't forget, in times of disaster or biological terrorism, you will need to filter all water including water used for brushing teeth, cooking and possible personal hygiene. Volume discounts only apply to Berkey Systems, shipped to the same address in a single shipment for the entire order. 15% discount on the purchase of six or more Systems. To qualify all systems do not have to be the same, you are permitted to mix and match sizes. Free shipping of Berkey Systems and orders over $220 to Canadian customers, we do not ship outside of Canada. Orders of less than $100 will be charged a flat fee of $20. Orders will be shipped via Canada Post Expedited service with the signature option. With this special pricing we can not accept returns. Every system is inspected prior to shipping for visible defects and to ensure all components are included. If you wish, we can quote you the additional cost of full insurance for loss or damage for the shipment from Canada Post. To order we prefer to have you email so that we get your address down correctly, if you prefer call us on our toll free number 888-810-4709. We will need your full name and full CC billing address, we will use this to verify you as the rightful cardholder. If your Berkey Equipment is to be shipped to other than your billing address, we will need this information as well. We will send you an invoice with your full address (s) and Berkey products listed. If the invoice is correct call us with your credit card number and its expiry. Returns and Replacement If your Berkey product has a manufacturing flaw please contact New Millennium Concepts and they will honour their warranty directly with you. 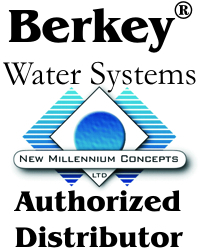 You can contact them at (888) 803-4438 or customerservice@berkeywater.com. If your product is damaged in transit, we insure the first $100. You as an option can pay for any additional insurance when you place your order with us. If your Berkey is not satisfactory and you return it to us unmarked and undamaged we will return the cost of the System if you have contacted us and received a return authorization number. We will not refund the cost of shipping or your cost to return the product. Any filters that you have primed cannot be returned for health reasons and we will deduct $120 per used filter pair. Send mail Linda with questions or comments about our product or web site.